The frequency range of interest is roughly 1 kHz to 1 MHz. The RF impedance of mains-connected devices is essential for e.g. power-line-communication. Very low impedance values at certain frequencies can drastically influence the transmission quality over the mains cables. 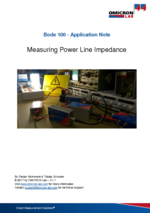 If you want to know more about how to measure power line impedance with the Bode 100 as well as how we designed the injection probe, current probe, high-pass filter and impedance stabilization, please download the following application note.